As one of the leading firms in management consulting, landing a job at McKinsey is incredibly difficult with a low, low offer rate of just about 1% worldwide. 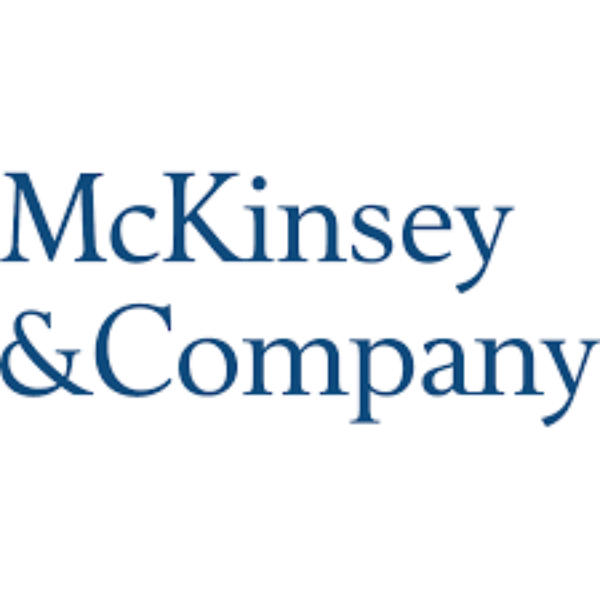 Regarded as one of the largest and most prestigious firms in consulting, McKinsey & Company is a NYC-based firm that boasts over 17,000 employees in over 100 offices worldwide. So, what makes McKinsey a highly coveted place to work, and how do they stack up against other consulting firms? We’re here to break it down for you. One of the hallmarks of McKinsey is mentorship, along with an emphasis on personal growth. McKinsey spends over $100 million per year solely on support and training for firm members of all levels. As an undergrad you won’t have to worry about being pigeon-holed into a single industry or function. In fact McKinsey encourages their analysts to work on a variety of projects all over the industry spectrum, allowing you to cultivate and realize your true passion, whether that be in a specific role at McKinsey or beyond. After working at McKinsey for a few years, you can be sure to have the personal tools that will open up the job market exponentially. Though at McKinsey there is no one ideal employee, there are certain characteristics that the firm explicitly looks out for when vetting firms. Those who land these highly coveted McKinsey jobs generally have a high level of personal impact, an entrepreneurial drive, strong problem-solving skills, and proven leadership abilities. McKinsey looks for prospective candidates who know how to take initiative and can deliver proven results for their clients. 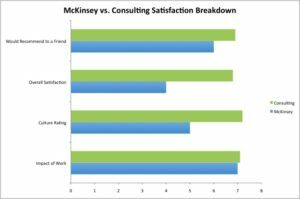 Below is the satisfaction breakdown for an entry-level analyst at McKinsey based on our TransparentCareer data as compared to the consulting industry average. While McKinsey rated fairly low in terms of overall satisfaction, they did score well on the Impact of Work category, which assesses how an individual feels their work truly makes an impact within the company. Also, do keep in mind that the ratings in all four categories did increase for associates at the company, meaning that while the first few years may be a little tough, as you progress within the company, employees typically become more satisfied. In terms of gender equity at McKinsey, currently 41% of the firm is made up of women, with women representing 39% of all new hires, and representation of women in senior leadership (or the top 6% of the firm) is at 11%. When compared to the consulting industry-wide average of about 44% this may seem low, other top firms such as Accenture are only made up of 36%. In addition, McKinsey is one of the leading firms in the field for research on the impact of women in the workforce. Their Women Matter research series has been pivotal in determining that there exists a positive relationship between corporate performance and gender diversity. McKinsey has also been one of the only companies to consistently receive a perfect score in the Human Rights Campaign Foundation’s corporate-equality index for LGBT equality for the past 9 years. Still interested in working with one of the top consulting firms in the globe? Well, with McKinsey’s interview process feared as one of the most rigorous in the country, it’s clear to see why they have a worldwide offer rate of almost 1%. In fact, McKinsey has its own PST, or problem-solving test, where interviewees may be asked to complete 26 multiple-choice questions on real past McKinsey cases. PSTs are not administered for every position, but if you do apply, keep in mind that you may be required to take the test either online or in person. The test is also not a substitute for the traditional behavioral and case interviews, but rather is an additional benchmarking tool for the candidates applying. McKinsey does offer extensive practice tools for both their case interviews and the PST, so don’t let that hinder you from applying if you’re still new to the consulting recruiting process.